Just like the foods that I put into my body, I am meticulous about the products that I put on my skin. That is why I make my own facial and beauty products. 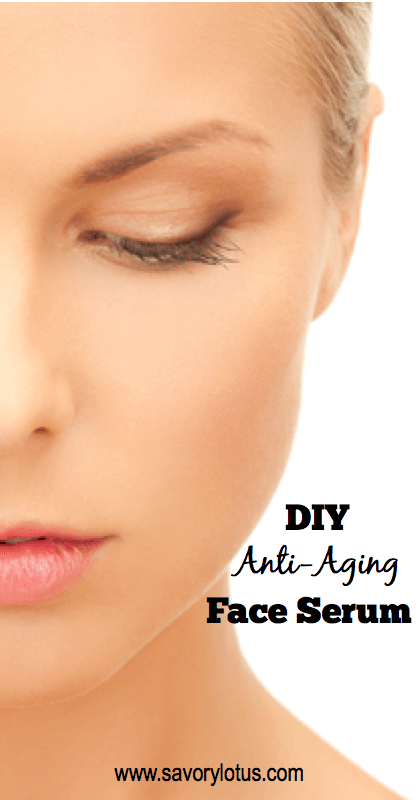 Here’s my favorite: DIY Anti-Aging Face Serum. You don’t have to spend a fortune to have beautiful skin. And you don’t have to rely on store-bought products that contain questionable ingredients. I have been making my own beauty products with simple, non,toxic carrier oils and pure, therapeutic grade essential oils. It’s super easy! You can read HERE why I prefer facial oils over creams and lotions. Essential oils have wonderful benefits for the skin. They have been used for ages to tone, smooth, and protect the skin. And they are 100% natural and non-toxic. Have you looked at the label of some of your skin care products? Your skin is the biggest organ in your body and readily absorbs all of those strange ingredients right into your bloodstream. I have been using my DIY Hydrating Face Oil for quite some time now. I love how my skin looks and feels. I created this Anti-Aging Face Serum to add to my skin care routine. I now use the Hydrating Face Oil in the morning and the Anti-Aging Serum at night. I love the combination. Why I make my own skincare products? In the US major loopholes in federal law allow the cosmetics industry to put thousands of synthetic chemicals into personal care products even if those chemicals are linked to cancer, infertility or birth defects. At the same time as untested chemicals have been steadily introduced into our environment, breast cancer incidence has risen dramatically. Only 11% of 10,500 chemicals in cosmetics have been tested for safety. The average woman absorbs 5 lbs of make-up chemicals PER YEAR. Mineral Oil, Paraffin, and Petrolatum coat the skin like plastic—clogging pores and creating a build-up of toxins. They slow cellular development creating earlier signs of aging. They disrupt hormonal activity. Parabens – implicated with cancer because of their hormone-disrupting qualities and traces of them have been found in breast tumor samples. What do I put in my face serum? I use jojoba oil as the base oil because it closely resembles the natural oils in our skin. It has anti-inflammatory properties and works great for dry, aging, oily, normal, or acne-prone skin. Rose hip seed oil is one of my favorite oils for my skin. It is good for dry, aging skin because it is deeply nourishing and regenerating. It is known for it’s firming properties. Rose hip seed oil is high in essential fatty acids and softens and smooths out the skin beautifully. It improves the texture of your skin and calms redness and inflammation. Vitamin E acts as an antioxidant and prevents the facial oil from going rancid. Frankincense essential oil is a valuable ingredient in skin care products for aging and dry skin. The ancient Egyptians used it in rejuvenation face masks. It has cleansing benefits to the skin, making it ideal for blemish-prone skin. It is also a natural toner, decreasing the appearance of pores and evening skin-tone. Myrrh is a very powerful essential oil from ancient times. The Arabian people used myrrh for many skin conditions, such as chapped skin and wrinkles. It is full of antioxidants, making it protective against aging skin. Lavender essential oil is highly regarded for skin and beauty. It may be used to soothe and cleanse common cuts, bruises, and skin irritations. It helps lighten the appearance of age spots and scars. It is wonderful for all skin types. Patchouli essential oil is especially beneficial for aging skin. It is used to reduce wrinkled or chapped appearance. It promotes new cell growth and smooths the appearance of fine lines and wrinkles. NOTE: I have diluted this face serum to a less than 1% dilution. The essential oils that I use are potent and powerful. Be sure to spot test on a small area to see how your skin reacts. If your skin is sensitive, feel free to dilute it a bit more with carrier oil. I have relatively sensitive skin, and this dilution works well for me. Remember: Not all essential oils are created equally! Please note that I am only talking about 100% pure, therapeutic grade essential oils. Only about 2% of essential oils sold are considered therapeutic grade. There is no standard for EOs and so many of the oils you find may be adulterated and can actually contain harmful ingredients. My essential oil of choice is Young Living Essential Oils. They own their farms and they run a very tight supply chain. I trust their essential oils above all others because they are pure and unadulterated and are manufactured for therapeutic use not just for smell. I am a wholesale member, meaning that I save 24% on all of my essential oils. Read more here about why I choose Young Living. So far, I have been using this oil for 2 months. And I LOVE it! I love that it is not super greasy. My skin just drinks it up. I have noticed a difference in the texture and feel of my skin. My skin seems more firm and toned. I hope that you love it too! Would you suggest combing the essential oils in your hydrating serum and those in your anti aging serum to just make one or is there a reason they are different? Thank you! Dilution do you use, just so I know when combining? Between your anti-aging and hydrating facial serum? I’m an essential oil newbie and don’t have all of the oils yet so I’m trying to figure out what is best to order next without breaking the bank! I use both the face oil and the serum. You can totally mix and match the oils in them. So if you only want to get a few oil, you can make your own version. I LOVE the Frankincense and Geranium the best. Myrrh is amazing too. Let me know how it goes. Thanks for your help! Do you have any tips or tricks for pouring and creating blends. Is a funnel or any other tools necessary? Great question! I usually just carefully pour the drops into my bottles. But recently someone gave me these little funnels—-> http://amzn.to/17g3upY. They make it a lot easier. One of my best friends is an oil freak (she buys the expensive stuff). I was over there tonight, she borrowed me a few and gave me the lemon oil. I think she said she dilutes hers with coconut oil. Just another option. ? Would any Frankincense work? I have Frereana Frankincense. Hi Katja! I’m very new to using essential oils and found your site when looking for info on a DIY face serum. I’ve read a lot and your recipe here is my first choice. I plan on making it soon, as well as your DIY hydrating face oil. I just have a question, how long does this serum, once mixed, last in terms of time? Will it go rancid if not used within a certain period of time? I’ve been using baobab oil (clean, without any added essential oils) on my face for a few weeks now and I’m hooked for life. I just came back to check your recipe here to make the serum, I have most of the oils now. Would you say one can mix different carrier oils with one another too? Love your site I am buying oils for my face to make up some recipes , Iwant to make another recipe for antiaging using vitamin c and hylaronic acid powder, aany suggestions? I heard adding green tea and or vegetable glycerin ? Maybe I should make up a toner using the ingredients since i willalready have moisturizing/antiaging serums using my carrier/essential oils. I made your recipe for the anti-serum face serum and it feels quite moisturizing. However, there is a lingering scent that doesn’t appeal to me. It’s either the myrrh or patchouli. Can you recommend something to tone that down? Thanks in advance. Hi, Julie! Maybe try adding a bit of Lavender? Or you could make another batch and leave out those oils and then mix the 2 batches. You can store half in the fridge until ready to use. Hope that helps. Hi Katja, for the anti-aging face serum recipe is it important to use 4 essential oils? I would like to cut down on cost. Thank you. Would you recommend using rose essential oil in this serum? Which skin type is it best for? And sandlewood? I have occasional oily skin in the t-zone but mostly it feels dry and tight now a days. Which oils would you recommend for the body? Can I use this anti-aging serum under eyes as an eye cream? If not, how do you make eye serum? Also, is this anti- aging serum for every night, or just for some days then stop for some days then start using it again? I am careful with essential oils right around my eyes. Some can be irritating if you get them in your eye. I do use my serums all over my face, but I am careful with my eyes. I use my serum every day. Hi, Marsha! My experience has been that my skin is way more hydrated in tropical climates. My guess is that you would need less oils and moisturizers. But the essential oils for skin will be beneficial in any climate. Hi Katja! Thanks for all your oil advice and recipes. I’m trying to cut all the chemicals out of my beauty products and make my own. Can’t wait to try your recipes. Just curious, what do you use to wash your face and what makeup brands do you use? Hi , I am wondering how you know how much of everything to add? I want to use grapeseed,apricot kernal,rosehip and jojoba for carrier oils and frankinsence and orange peel essential oils, but how much? Hi, Darlene! You will have to experiment to get the right blend for your own skin. I would add the most jojoba as the base and smaller amounts of the others. You can see that I use WAY less of the rose hip oil. One and half tsp is plenty for this amount. This recipe is a 1% dilution of EO’s to carrier oil. 1% = 1 drop of EO per teaspoon of carrier oil or 5-6 drops per ounce. Hope that helps. Hello, Thank you for all the great information on your site. I am trying to make my own anti aging recipe. I would like to use jojoba, evening primrose, borage seed oil, rose, sandalwood, neroli, geranium, frankincense, clary sage, carrot seed, lavender, myrrh, patchouli, and vitamin E, do you think that is to many oils? I see that these oils all do great things for anti aging. You can use as many oils as you like. There are no rules. The only thing with that is if you react to something, it’s hard to know which one it is. I usually like to stat with just a few. But if you know that you are OK with all of those, go for it! Hi, love your site, everything is well explained. Can you pls what oils /carriers is best for acne considering his age. May – did you find something that worked? I have a 14 year old daughter. I get that the gut can be an issue but I want to make changes to the skin care routine. I am new to all of this. I bought jojoba and tamanu oils and will create a blend of those to start before adding in any oils. She is using Clearity by Primally Balanced for now. Just curious if you found something you/he like. Thanks. IrI can’t access pure jojoba oil here in Nigeria so I wanna know if I can replace it with Sweet almond oil. Hi azeezat…please where did you get your sweet almond oil. I’m in Nigeria as well. This looks like a recipe for performing your face; I don’t see any ingredients proven to help with signs of aging (Niacinamide, ferulic acid, Vitamin C, ceramides, etc). Because skin is so easily sensitized to fragrances, it seems like you’re taking a big risk putting these scents on your face. Hi, Lucie! Yes, I agree that we must be careful with our skin. And if you know that you are sensitive to fragrances, then this recipe is probably not for you. I have taken care to keep the ratios pretty small and diluted. But it’s important to test your own personal skin before using any new products. I love Vitamin C for my skin. Would be great to be able to incorporate it into my serums. *perfuming, not performing. Please excuse my English. Loved the serum recipe! I want to make a water/ aloe gel based green tea serum using matcha green tea as I’m trying to create a dupe for innisfree green tea serum which was really good but expensive. Want to ask you for my diy serum’s guidelines? What should I put in it? I have a few essential oils, matcha tea, Argan oil, pomegranate seed oil and some other as well but just don’t know how I go about it. Please help! I am not familiar with that serum. I checked out the ingredient list- which is pretty long. It’s hard to say without trying it what the consistency is. You wold just have to experiment with the ingredients that you love and see how it goes. 🙂 Sorry I can’t be more helpful. Hello! What if the oil is too ´greasy´? Any ideas what i can add? And even if I feel it’s greasy my skin feels dry?!? HI! HOW LONG OF A SHELF LIFE DOES THIS SERUM HAVE? I’m so happy to find your blog. A few weeks ago I read something online about oils and started to add Palmarosa Oil to my regular moisturizer. I got pretty good results. So then I started using a Vit. E oil with my Palmarosa added. I’ve only been doing the oil and Palmarosa for about a week and am amazed by the results. I’m 75 and my skin absolutely glows. Today I found a product line called S.W. Basics. Their products contain 3, 4 and 5 ingredients, all oils. One is a rosewater spray. I was impressed. Your serum recipe sounds delicious. Am going to gather the oils and add as I acquire them. Just recently I added some Tea Tree Oil to my Vit. E Oil for itchy skin on my legs. Itch totally gone after one night. Do you know anything about Aura Cacia? My local market carries that brand. I buy the organic. Thanks for all your great information! Hi, Jez! So great that you are finding things that work for your skin. I love that your skin is glowing.Life goals for me as I age. 🙂 I am not familiar with that brand so cannot speak to it. Thanks for stopping by. One more question. I bought some Aura Cacia Rosehip Oil today. I notice you recommend Rose Hip Seed Oil. Mine says “Organic Rosa Canina (Rosehip) Fruit Oil”. Does that function more or less the same as the Rosehip Seed Oil? Thanks. BTW, I love the questions and replies in the Comments. 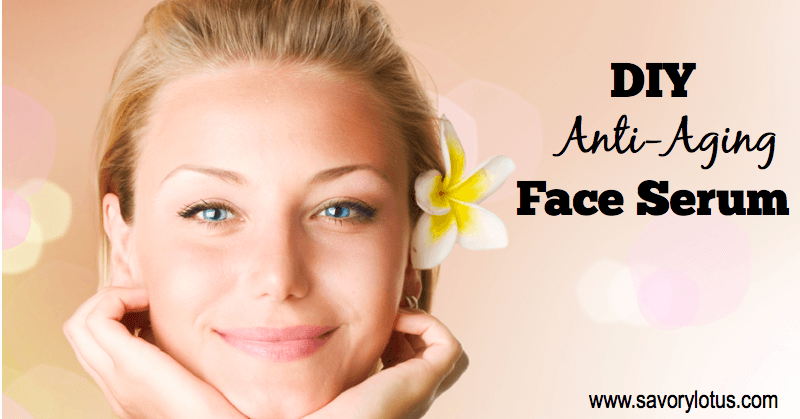 How can you incorporate Vitamin C for facial products? Also what do you use for a SPF on your face if you don’t anything besides the serum? I know many people who just use coconut oil or olive oil for the body. Or you can play around and mix with jojoba oil. It all depends on what type of skin you have and what your skin likes. Pls I want to know if the face oil is okay to be applied on the face directly from shower with water on the face or the face should be dry before applying? I usually apply to dry skin. I add a couple of drops of sweet orang or bergamot to brighten the scent a little. Hello hello! So I’ve decided to follow this recipe for my first ever homemade face serum (yay!) but the process of finding a good quality carrier oil is overwhelming! For example, The Ordinary’s Organic Rose Hip Seed Oil is only $10. But then most other companies selling organic rose hip for the same amount of oil is charging around $30. So what are the discrepancies? How do I really know what oil is the highest quality? There doesn’t seem to be any regulations in place to validate the quality of an oil. Please help! The links you attached to the oils you purchase once upon a time aren’t valid anymore. Thank you! My skin is dry and at times sensitive and I’m middle aged. Do you need to add essential oils to make a serum or can you make serum just by using a variety of carrier oils? Hi, Monica! You can definitely just use carrier oils. They are wonderful and hydrating all on their own. There are so many factors that affect wrinkles : genetics, sun damage, moisture in skin, diet etc. And wrinkles just happen as we age. Yes, this serum will help soften and smooth the skin over time. Staying hydrated, eating a clean diet with lots of healthy fats, getting enough sleep, and protecting our skin from too much sun can help keep our skin looking it’s best. Hope that helps.